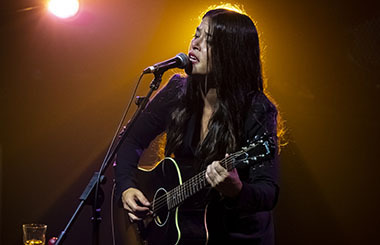 The US singer/songwriter RACHAEL YAMAGATA returns for the first time since six years back to Ireland on her 2019 Euro Tour, performing not only her classic iconic songs but also new material from her new releases “Porch Songs” and “Tiightrope Walker”. On stage RACHAEL YAMAGATA reveals all facets of her skills: lot of power in her voice, sensitive lyrics and a combative sound. A “Tightrope Walker” is a person who goes its way undeterred while always feeling the abyss. Inspired by the famous tightrope walker Philippe Petit who walked from one to the other of the Twin Towers in New York City back in 1974. Rachael feels sometimes the same excitability as an independent artist. You have to rely on yourself feeling the overwhelming adrenaline when your on stage. RACHAEL YAMAGATA self-produced “Tightrope Walker” and brought her long-time producer, 3x-Grammy nominee John Alagia (John Mayer, Dave Matthews Band) onboard halfway through the process as co-producer. She rounded up an illustrious array of guest performers, including Ben Perowsky (Rufus Wainwright), Zach Djanikian (Amos Lee), Kevin Salem (Yo La Tengo), Grammy Award winners Owen Biddle (The Roots), Matt Chamberlain, and Victor Indrizzo, as well as celebrated musicians Russell Simins (Jon Spencer Blues Explosion) among others. Rachael Yamagata is not your ordinary singer/songwriter. Yes, she has released numerous albums; had record label deals; toured the world multiple times with sell-out concerts; built a loyal and ever-growing fan base; earned her place as a media ‘darling’; made appearances on Jay Leno, Conan O’Brien, Carson Daly, “30 Rock,” “One Life to Live” and “The O.C.”; been an NPR profiled artist; made a cameo appearance as herself in Sony Pictures’ To Write Love on Her Arms; had song placements in hit TV shows including “NCIS: New Orleans,” “Vampire Diaries,” “Grey’s Anatomy,” “Alias,” “How I Met Your Mother,” and in and Hollywood movies including “Hope Springs,” “Prime,” “Monster-in-Law,” and “Sisterhood of the Traveling Pants”; been nominated Best Female Vocal by the Chicago Music Awards (2012); opened for artists including Patti Smith, David Gray, and Pete Townsend; and performed at venues including Madison Square Garden, Radio City Music Hall, Carnegie Hall, SXSW, Austin City Limits, Glastonbury, and Bonnaroo. Rachael has collaborated with artists including Ryan Adams, Ray LaMontagne, Conor Oberst, Jason Mraz and Toots and the Maytals, She’s toured with many of said artists, as well as Joshua Radin, Sara Bareilles, Amos Lee, Liz Phair, and more. Rachael was invited by the White House to take part in its Official White House ‘Tweet Up’ in the West Wing with fans, and was one of Chopra’s music playlist selections featured on Oprah Winfrey’s website.